Designing a platform for everything Marvel. 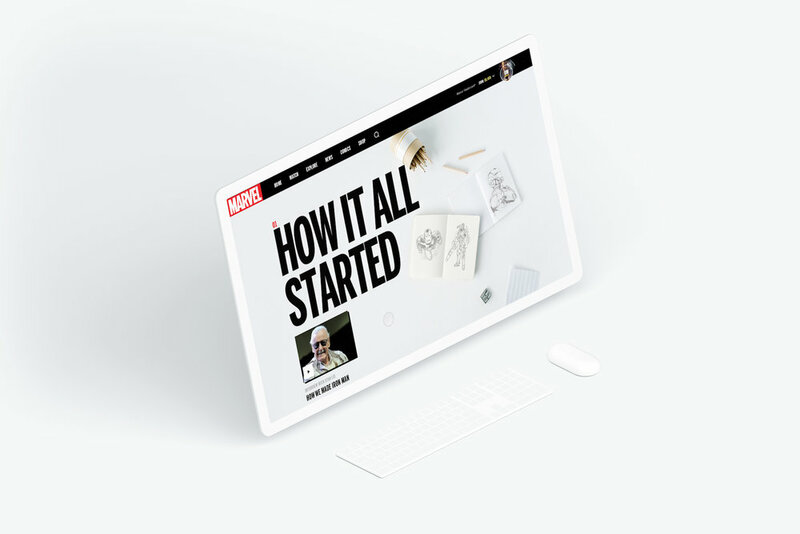 In 2017, Marvel asked Huge to propose solutions for unifying its many comic book storylines into a single digital platform. The work, to which I contributed as both a Product and Visual Designer, represents the talent and ideas of not only myself but also the close-knit design team I worked with at the Los Angeles office. Marvel's stories have been able to accomplish an incredible feat by attracting many different generations. In order to maintain this standard, they face the eternal question of how to evolve storytelling for maturating fans with different levels of engagement and knowledge of the Marvel World. As identified during our work, super fans—not finding content that speaks to them at Marvel—often turn to third-party blogs and YouTube channels for engagement, highlighting a missed opportunity for Marvel to take part in those conversations. The approach to keep a Marvel-owned platform exciting and appealing to all generations was at first to make it adaptive. Fans from different ages and levels of engagement with the Marvel Universe have different expectations and are looking for content that reflects the conversations they are willing to have. To accomplish that, we followed the lead of social media and proposed instead of fighting external content creators who fans are already attached to and trust, bringing them in. An identified problem during the work was that content on Marvel.com can easily turn off super fans that are looking for deeper conversations. In order to address the need to speak to all audiences, rather than fighting the third-party bloggers and YouTubers who catch superfans' attention, the strategy was to bring those people in and get them to help elevate the engagement within the platform. Rather than just follow their heroes, users could also follow channels with content produced by the people with whom they engage. Marvel TV brings content creators from the web to engage fans, who tend to stay away from marvel.com as they mature, with exclusive content and conversations inside the Marvel platform. Adapting content as fans increase knowledge and mature in order to stay relevant. As mentioned before, Marvel stories appeal to many different generations and those do mature with time. When that happens, so should the content displayed to them on the platform. Depending on what stages users are in, finer details and news would start being populated, replacing the general appeal stories. We thought this experience should be more than a passive one and empowering the user to create their own piece of content and share it on social media as a gif or meme could give Marvel the opportunity to spark thousands of external conversations around its universe everyday, creating greater awareness of the platform.